Product Features： # A super fast and high-capacity data transfer solution. # Compliant with USB 3.0 specification. # Date transfer rate up to 5.0Gbps / 625MB/s. # Compatible with USB 2.0 & 1.1 specification. # Compliant with Single-Lane (x1) PCI-Express specification revision 1.0a. # Supports 2.5Gbps PCI-E bus with full duplex channel. 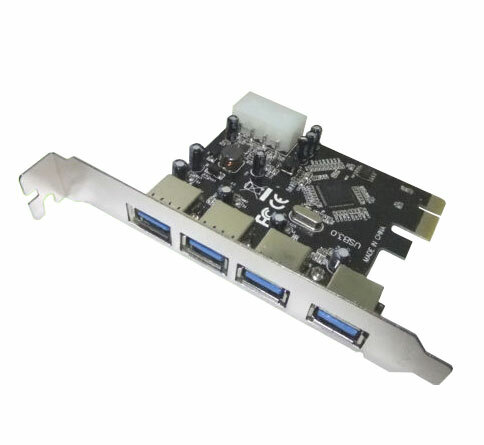 # 4 USB 3.0 type A female connectors. # Plug & play and hot swapping capability. # Bus-powered mode and no external power required for most of peripherals. # 4 pin power connector available for some high current consumption peripherals, like drives. # Supports win2000 win2003 winxp vista32 vista64 Win7 Characteristics： # compliant with usb 3.0 specification revision 1.0. supports Low-speed(1.5Mbps)/Full-speed(12Mbps)/High-speed(480Mbps)/Super-speed (5Gbps). # Supports 4 downstream ports for all speeds. # Supports all USB compliant data transfer type as follows;Control/Bulk/Interrupt/Isochronous transfer. # Compliant with Intel is extensible Host Controller Interface(XHCI)Specification revision 0.95. # Support USB legacy function. # Compliant with PCI Express Base Specification 2.0. # Supports PCI Express Card Electromechanical Specification Revision 2.0. # Supports PCI Bus Power management interface specification revision 1.2. # Supports external power socket in order to supplying power for each USB 3.0 connector up to 900Ma Max/port.